Lombok as the one small island in Indonesia which has many unique culture seem in the procession ceremony and ritual of it society. One of their unique cultures seems in wedding procession. This processions series start with Selarian, is the man take his girlfriend runaway from house to go to the man house for marriage. In the next day, the man will send the family or friend as his representative to come to woman house to inform that she going to marriage with the man, this procession called Selabar. Something unique in this procession is the woman who already gone for Selarian will not go back home even their family didn’t agree with her marriage, the procession should going till the last steps. After Selabar, woman family will send their representative (man) to do the wedding ceremony or merariq as the procession to get the legality of a wedding. And the last procession called Nyongkolan, this procession is to celebrate the wedding and take the woman back home to meet her family. During the procession, it takes many people to participate walk from the man house to woman house, it is interesting to see this procession because the people wearing colorful traditional custom, music Gendang Beleq and decoration to make the situation become so much fun. In every Nyongkolan parade should have a Pembayun, is the old man who believed to talk and do Adu Pantun Sasak (sasak poem battle) very well. When the group arrived in the woman house, Pembayun will be in the front of the group and become the one person who can talk with the woman family. He will talk with very polite sasak language and doing adu pantun sasak till got the winner. And the loser have to pay some money or what they wearing in meantime, such a watch to the winner. After this session then the woman can meet their family. 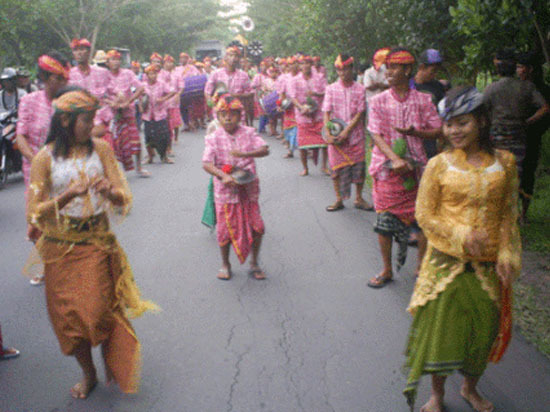 The line of parade Nyongkolan divided into three parts; first part is the line of brightness with her friends, generally it is followed by 40 women. In the second line is the bright part and the last line is the part for music (Gendang Beleq or Kecimol). This procession is easy to find in Mid Lombok, available every Saturday and Sunday especially after Lebaran Holiday. This parade also be the reason of the traffic jam in Lombok but it will not make people bored because they can see unique culture, music and custom while in the traffic.